Like many neighborhoods in urban areas around the world, residents of New York City’s Chinatown are facing displacement as they watch the culture of their community change around them. 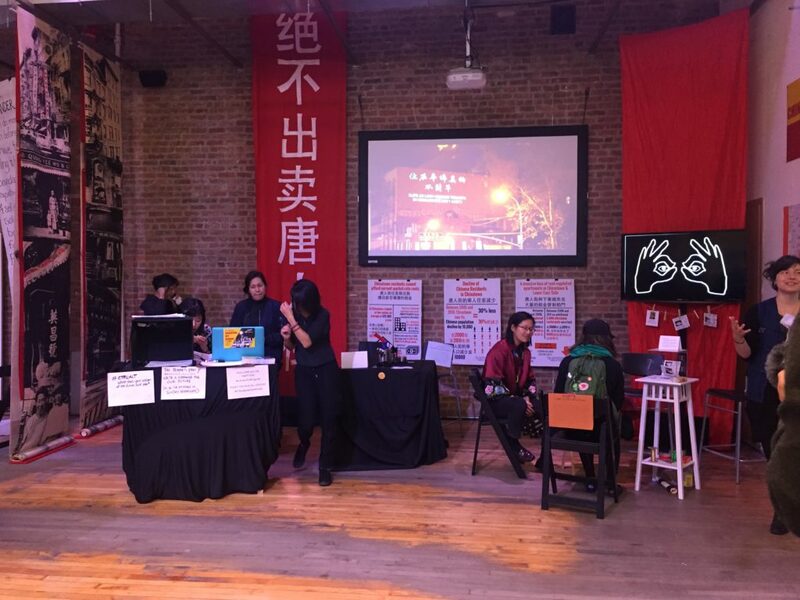 In 2015, artists and activists Tomie Arai, ManSee Kong, and Betty Yu formed Chinatown Art Brigade to combat these issues. 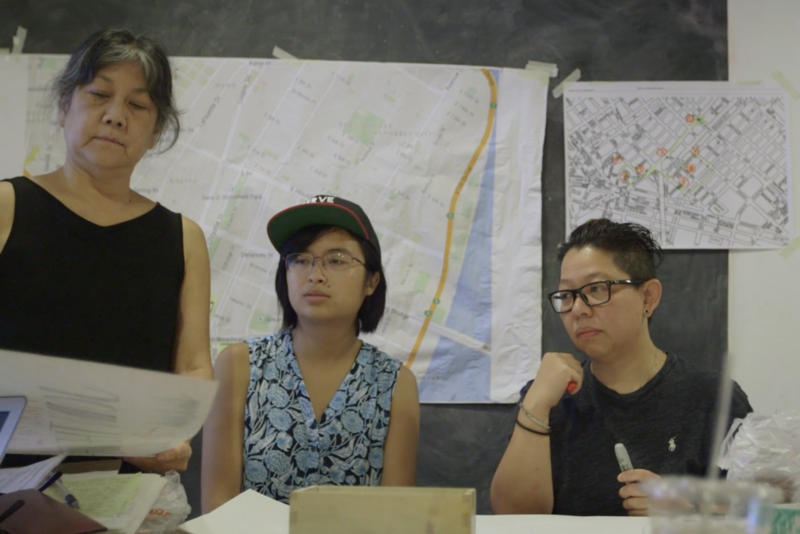 Drawing on their individual work as activists and artists in the neighborhood for decades, Chinatown Art Brigade addresses gentrification, displacement and community resilience in Chinatown through art actions in the streets. Project collaborator Ryan Wong took the time to talk with ABOG’s Johanna Taylor about histories of activism in Chinatown, the role of art as instigator for social change, and his experience working with Chinatown Art Brigade on their ABOG fellowship project Here to Stay. ABOG: How long have you been involved with Chinatown Art Brigade? RW: I have known ManSee, Betty, and Tomie each for several years – each of them separately through different activist and arts projects. The first official thing I did with the Art Brigade was as a respondent on a panel they hosted at the Wing On Wo Project about gentrification in Chinatown. It was later covered in Artsy. ABOG: That seemed like a necessary and timely event. What other work related to art in Chinatown have you been involved in that led to your participation on the panel? RW: I used to work at the Museum of Chinese in America. Then I started to research a history of the Asian American movement in New York and Chinatown, the period from the 1960s to 1980s. Tomie was part of that movement and the full lineage of Asian American arts collectives, mostly based in Chinatown. What’s really interesting to me about the Art Brigade is that they fall into this lineage of projects starting from the Basement Workshop to the Asian American Arts Center. Tomie was also involved in the City Arts Mural Project that happened in Chinatown. ABOG: When did the movement start? RW: Basement Workshop started in 1969. This was one of the first self-identified Asian American arts collectives in New York. And ‘Asian American’ itself, as an idea, was still under-coined at that point. Tomie was one of these people who helped to articulate the idea of Asian America early on. Basement was an umbrella organization out of which sprang the Asian American Art Center, Museum of Chinese in America, Asian CineVision… really a remarkable history. ABOG: So how does Chinatown Art Brigade fit into this legacy? RW: When you trace these different arts collectives in Chinatown, each has different goals and different actors involved, but each responded to their time. Basement Workshop was very activist, it was involved in things like Confucius Plaza struggle, which worked to give Asian Americans jobs on building the Confucius Plaza Apartments tower in Chinatown (completed in 1975). Similarly, Chinatown Art Brigade is identifying gentrification, displacement, and tenants rights as the critical issues of the moment in the neighborhood. What’s interesting about this is that where past arts collectives were focused on building up a cultural presence, Chinatown Art Brigade is making a distinction that it is not necessarily good to have just any kind of culture, but rather that it’s through emphasizing the culture already in the neighborhood that we can really engage the people of Chinatown. To do this they are using many different tactics. They’re not just making work for a gallery space but they are very much public artists: projecting illuminations, doing well-attended panel discussions, workshops, and liaising with CAAAV (Committee Against Anti-Asian Violence, umbrella organization containing the Chinatown Tenants Union). Meeting at CAAAV, image courtesy RAVA films. ABOG: How does their public art interface with the community in Chinatown? RW: Chinatown is an incredibly complex, multi-layered, multi-faceted community, making access a key question in anything that happens in Chinatown. The Art Brigade uses key approaches to ensure access. They make an effort to create bilingual signage. They collaborate with community groups like CAAAV that can reach working class communities and others who may not otherwise be able to access the information. Their public interventions force conversations to happen on the sidewalk, which is crucial because there aren’t a lot of public cultural spaces in the neighborhood. One of their projections happened at Sara D. Roosevelt Park, which is populated by a lot of older Chinese Americans. ABOG: What does the name “Chinatown Art Brigade” or their specific project name “Here to Stay” mean to you and the community? 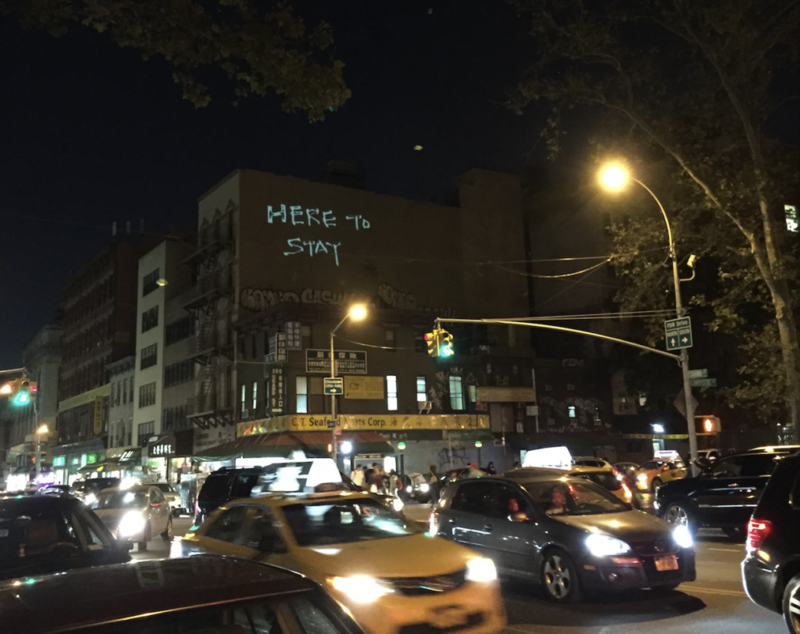 RW: From my perspective, “Here to Stay” speaks to gentrification in a direct way. And displacement. And to a right to the city. This community engagement perspective is a key issue both for community organizations and for socially engaged art projects. There is a lot of pressure on artists to move away or move on from projects, and the name shows that this isn’t a one-off: that they are committed to the neighborhood. ABOG: Are there any projects of note that you have collaborated on with the Chinatown Art Brigade lately? RW: We just finished a big collaboration as a part of the Smithsonian’s Asian Pacific American Center’s project CTL+ALT at the former Pearl River Market. Chinatown Art Brigade was a participant and also invited me to curate a mini-exhibition about the store itself and its history that was based on an oral history that Chinatown Art Brigade initiated with the Chen family, the owners of Pearl River. They produced a short documentary about Mr. and Mrs. Chen who began Pearl River as a political project in the 1970s. Because trade was essentially forbidden between the U.S. and China during the Cold War, they were one of the few places to sell anything from mainland China, things like Red Books and soy sauce. They were hugely successful, even from the start. ABOG: That sounds like a fascinating story! Having spaces to find familiar cultural objects is essential for migrant communities. RW: The question of space more generally is key. It always has been in the New York City art world, but the issue now is about affordability and sustainability. The Art Brigade is opening an uncomfortable conversation for a lot of a people about for-profit art spaces and displacement. They have made it clear that they are not against all galleries and that they are not telling people to stop producing art, but that we need to have critical conversations about how these spaces contribute to the community without leading to displacement. ABOG: Are there other notable aspects of Chinatown Art Brigade’s approach that enable them to facilitate their unique blend of art and activism? RW: It is notable that it’s a woman-led project and that it is a collective. This cuts against the typical art world focus on an individual artist or more specifically an individual male artist. It is significant that they choose to stand together as a collective. This brings a unique perspective and mission that can only happen with their particular mix of identities and experiences. Ryan Lee Wong is a writer and cultural organizer based in Brooklyn, and a Visiting Scholar at the A/P/A Institute at NYU. His arts writing appears in The Village Voice and Hyperallergic. He organizes exhibitions and workshops on Asian American movement histories.